Some associations are resource rich, others are not. No matter your bank of available resources, let's share so we increase our collective pool of inexpensive and/or FREE PD resources (and opportunities)! Favorite new (and current) resource? Before the Zoom meeting, choose your favorite 4-5 resources so you can share and tell others why you like this resource so much. 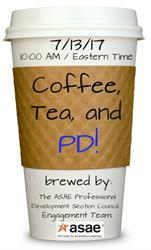 Bring your favorite mug o' joe (or tea) and join us for a quick and enriching resource share session!